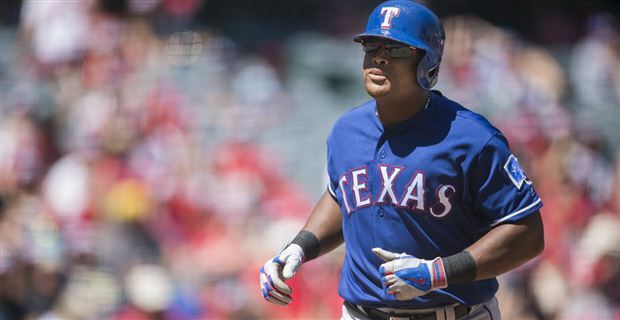 Senior Fantasy Baseball Expert Shawn Childs preview the Rougned Odor and the Texas Rangers heading into the 2018 MLB season! The Rangers had a nice eight-year run where they won 87 games or more in six seasons leading to five playoff berths and two World Series appearances. In 2017, Texas finished with a losing record (78-84) due to a second straight fade in their pitching staff. The Rangers placed 21st in the majors in ERA (4.66) while allowing 159 more runs than 2016 (757). Their bullpen had the third highest bullpen ERA (4.76). Texas had plenty of power (237 home runs – 3rd), which led to 9th most runs (799) in the majors. The Rangers outscored 2015 (751) and 2016 (765) teams that won their division. In the offseason, they lost 1B Mike Napoli, OF Carlos Gomez, SP Andrew Cashner, and RP Jason Grilli to free agency, Their offensive structure will look almost the same at 2017 with the only upgrade being OF Willie Calhoun. Texas acquired him last summer in the deal for SP Yu Darvish. The starting rotation will consist of three new options – Matt Moore, Mike Minor, and Doug Fister. Moore came via a trade with the Giants for a pair of minor league players (P Sam Wolffand P Israel Cruz). Both the bullpen and the starting rotation will rank below the league average with minimal upside in the minors. The Rangers still have the talent to score plenty of runs. Overall, they look position to finished fourth in their division without multiple players stepping up on the pitching side. After an injury-plagued season in 2016, Choo produced the type of season that Fantasy owners expected of him. His AVH (1.620) fell in line with his recent resume with a rebound in his CTBA (.354). Shin-Soo had the same approach shown in his career (K rate – 21.1 and walk rate – 12.1). His run rate (44) and RBI rate (18) ranked at the top of his career range. He hit well against lefties (.287), but only one of his hits over 122 at-bats left the ballpark. Choo needs to improve against RH pitching (.254 BAA). His game was more steady than explosive in most months while showing risk in his batting average in four different months (May – .244, June – .253, July – .231, and September – .244). Even with a bounce back in power (22 HRs), he had a regression in his fly ball rate (26.2 – 30.6 in his career). Shin-Soo had a career-high HR/FB rate (20.4). A Veteran player whose health will be helped by playing DH, but his speed doesn’t look repeatable at age 35. His best days look to be behind him while his recent resume lack back-to-back productive and healthy seasons. Neutral hitter at best with league average runs and RBI with 550 at-bats. I’d draft him thinking 15+ HRs with a handful of steals. In this case, I would bet the under on his overall season. The two most interesting players heading into 2018 for me are Andrus and Jose Ramirez. Both players had a huge step up in power while owning speed favoring skill sets over their early careers. Elvis added length to his hits (AVH – 1.586) for the fourth straight season while repeating his 2016 CTBA (.352 to .351). For the second year in a row, Andrew had a strong RBI rate (18). His RBI chances have been in a plus area in three of the last five seasons (428, 406, and 405). Even with a career high in HRs (20), Elvis also hit the most doubles (44) of his career. His quest for longer hits led to a career-high K rate (14.7), which still ranks well above the league average (20.3). Andrus took the lowest number of walks of career (5.5 percent). His swing played well vs. RH (.298 with 13 HRs and 67 RBI in 500 at-bats) and LH (.294 with seven HRs and 21 RBI in 143 at-bats) pitching. Elvis had his best production in May and June (.313 with seven HRs, 38 RBI, and 15 SBs). He had 20 SBs at the All-Star break, but Andrus lacked the green light over the second half of the year (five SBs). Most of his at-bats (564) came in the second and third slots in the batting order. His swing path still produces a high volume of ground balls (48.5), but it is well below his first six years in the majors (55.0 percent higher in each season). Elvis had a career-high HR/FB rate (11.6), which was well above his career average (5.1). Andrus has 1,547 hits at age 28, which gives him a reasonable chance at achieving 3,000 hits for his career. A nice five-category player who continues to improve. I don’t like buying a player after a career year, but I sense he has more in the tank. Possible .300+ batting average with 100+ runs, 15+ HRs, 80+ RBI, and 30+ SBs. His power will be the key to his final 2018 value. If a Fantasy owner removed Odor’s batting average from their decision making, Odor would rank highly due to his power/speed combination. In 2016, Rougned entered the March draft season with an ADP of 94. This season he’s dropped 20 spots in the draft rankings due to his weakness in his batting average. HIs run rate (51) remains one of the best in the league while having a drop off in his RBI rate (12). His K rate (24.9) was a career high and much higher than his early major league resume (16.8 in 2015). Odor barely takes any walks (4.9 percent). Rougned had a huge step back in his CTBA (.281) after setting a career best in 2016 (.349). With each year with Texas, his AVH (1.960) has grown stronger. Odor had no answer to lefties (.145 with five HRs and 18 RBI over 159 at-bats) in 2017, an area that he was much better in 2016 (.269 with seven HRs and 20 RBI over 156 at-bats). Last season Rougned only had one month where he hit over .220 (July – .266), which ended up accounting for one-third of his HRs (10). Power, check, speed, check. His run and RBI totals will follow with more hits and a step up in walks. Odor was a career .285 hitter in the minors and .265 over first three years in the majors. With a clear head and a fresh start, I expect a middle of the order season from Rougned. I’d draft him safely with a .270 batting average with 100+ runs, 35+ HRs, 100+ RBI, and 20+ SBs in mind. Great value player in 2018. Beltre finished 2017 with his lowest total in at-bats (340) since taking over a starting job in the majors in 2000. He missed almost the first two months of the season with a calf injury. His bat was very productive over his three months of action (.315 with 16 HRs and 66 RBI over 295 at-bats) highlighted by an electric RBI rate (23) on the year. His AVH (1.708) fell in a range with his 30+ HR seasons while having a rebound in his CTBA (.368). A hamstring injury cost him the first half of September and a slow finish to the year (.289 with one HR and five RBI in 45 at-bats). Last season Adrian had the highest walk rate (10.0) of his career with strength in his K rate (13.4). His swing was dominate vs. lefties (.388 with four HRs and 16 RBI in 67 at-bats) while playing well against RH pitching (.293 with 13 HRs and 55 RBI in 273 at-bats). HIs HR/FB rate (15.6) was his highest level since 2012 while delivering a below career average (39.1) fly ball rate (37.1) for the third time in four seasons. With 3,048 hits in the bank, his next target is 500 home runs (needs 38). Hall of fame player who continues to produce winning at-bats.He’s getting close to a DH only player. Set his floor at .300 with 25 HRs and 85 RBI while understanding a healthy season will add more strength to his stats. Take the age discount while gaining an edge elsewhere on your early roster. Mazara had some ups and downs in 2017. In the end, he had growth as a run producer (RBI rate – 20) with improvement in his approach (8.9 percent walk rate). His K rate (20.6) was a step back from 2016 (19.6) while producing a weak run rate (33). His failure in batting average was due to lower CTBA (.328) while his minor league resume points to more upside in this area (.405 in 2012, .362 in 2014, and .374 in 2015). Nomar crushed the ball in early April (.352 with four HRs and 16 RBI over 54 at-bats), but he stumbled over the next three weeks (.127 with one HR and five RBI over 62 at-bats). Over his next 34 games, Mazara hit .323 with five HRs and 25 RBI in 127 at-bats. His bat came with a .251 batting average with nine HRs and 49 RBI over 267 at-bats in his last 71 games. Almost all of his production came against RH pitching (.269 with 19 HRs and 88 RBI in 431 at-bats). His next area of growth will have to come against lefties (.228 with one HR and 13 RBI in 123 at-bats). In 2017, his fly ball rate (34.2) was much higher than 2016 (29.7). His HR/FB rate (13.6) regressed from last year (16.4). A young player on the rise, but I’m not sure he’s a third hole hitter, which he was given 76.2 percent of the time last season. Not quite ready for 30+ HRs, but a .270 year with 25 HRs and 85 RBI seems to be in his wheelhouse. If you want to bet on the come, Nomar isn’t that far off from becoming a 30/120 player with more length added to his hits and a slight better swing path. Calhoun has the approach to have success in his rookie season in the majors. His walk rate (8.6) is above the league average (8.3) with a low K rate (11.6). Over three seasons in the minors, Willie hit .286 with 69 HRs, 229 RBI, and six SBs in 1,274 at-bats. His average hit rate (1.904) improved in each year in the minors while his swing for the fences style did hurt his CTBA (.292) in 2016 at AA. His biggest weakness continues to be his glove. A switch to left field will do him well plus Calhoun could see some time at DH to keep him in the starting lineup. His swing path looks balance with a chance to produce a high volume of fly balls based on his minor league season at AAA (over 45 percent). Willie has a HR/FB rate of 15.0 or higher in each of the last two years in the minors. 30+ HR swing with a low K rate should give him an opportunity to win starting at-bats in 2018. Gallo has amazing power highlighted by his huge AVH (2.564) in his first season in the majors and supported by his minor league resume. Last year he almost had more runs (85) and RBI (80) than hits (94). His K rate (36.8) invites huge batting average risk, but it did improve over his first 153 plate appearances in the majors (49.7 percent). Joey has a very good eye leading to a high walk rate (14.1). He had a higher batting average against lefties (.226) even with 51 Ks in 106 at-bats). Gallo hit 34 of his 41 home runs off RH pitching with a short average (.204). His season started with 16 HRs and 33 RBI over his first 174 at-bats before whiffing his way out of the lineup in June and July (.183 over 115 at-bats with nine HRs, 14 RBI, and 52 Ks). He rebounded for a strong August in power (11 HRs and 22 RBI in 69 at-bats). His swing delivers a huge number of fly balls (54.2 percent in 2017) with an immense HR/FB rate (30.1). Over five seasons in the minors, Joey hit .254 with 152 HRs, 375 RBI, and 32 SBs over 1,736 at bats. League-leading power swing with 550+ at-bats and many those bombs will come with runners on base. His swing and miss approach can lead to lost playing time or even another trip to the minors. I’d draft him for the power and complementary speed while knowing I’m positioned to punt batting average. Chirinos spent the early part of 2017 riding the bench while Jonathan Lucroy gave Texas many empty stats. As a backup hitter, Robinson hit .227 with 12 HRs and 26 RBI over the first half of 2017 covering 132 at-bats. With a bump in playing time in August and September, he hit .282 with five HRs and 12 RBI in 131 at-bats. HIs walk rate (11.0) was a career high with risk in his K rate (25.6). Chirinos played great against lefties (.366 with six HR and 14 RBI in 71 at-bats). Even with 11 HRs and 24 RBI in 192 at-bats against righties, he struggled to make contact (.214 BAA). Robinson has a fly ball swing (46.2 – 43.0 in his career) with two straight years of strength in his HR/FB rate (19.1 and 20.0). Nice C2 in deep leagues with a chance to set a career high in at-bats. A .230 hitter with a 20+ HR upside if given 450+ at-bats. 9. OF Delino DeShields Jr. When looking at DeShields’ career resume, one stat stands out. His run rate (54) has been special over his major league career pointing to a huge run total with 550 at-bats with the Rangers. His K rate (24.8) remains too high for his skill set but he’s still taking a solid number of walks (10.0-rate). Over a 58-game stretch with starting playing time in late April, DeShields hit .298 with 39 runs, two HRs, 17 RBI, and 17 SBs in 178 at-bats. After the All-Star break with sporadic starts, he hit .250 with four HRs, nine RBI, and 10 SBs in 180 at-bats. He played better against righties (.277 with two HRs and 16 RBI in 256 at-bats). Leadoff-type batters with 50+ SB ability while not being dead in the water in home runs. DeShields Jr. needs the Rangers to commit to him in 2018, which mean not signing another free agent outfielder. This year he’ll jockey between batting leadoff and at the bottom of the order with his speed playing well. His minor league resume (.267 over 2,177 at-bats with 40 HRs, 247 RBI, and 262 SBs) paints him as a neutral hitter with double-digit power and 50+ SBs plus impact runs and improvement in his RBI. Profar falls into the post-hype category. In his career in the majors, he hit only .229 with 12 HRs, 53 RBI, and five SBs in 633 at-bats. His walk rate (9.1) is above the league average (8.3) with a neutral K rate (19.8). Last season Jurickson had no answer for major league pitching (.172 BAA) leading to low AVH (1.200) and CTBA (.227). His approach did look better at AAA (43 walks and 33 Ks), but his production was flat in power (seven HRs) and speed (five SBs) over 327 at-bats. Over seven years in the minors, Profar hit .279 with 47 HRs, 246 RBI, and 62 SBs in 1,845 at-bats. Early in the minors, he appeared to have a 15/25 skill set. Now both categories can’t be trusted now. No clear path to playing time plus his overall game needs to make a huge step forward. Don’t dismiss if he is showing productive at-bats in the majors. Guzman will be the fallback plan at first base if Joey Gallo strikes his way out of the majors. Over six seasons in the minors, Ronald hit .274 with 51 HRs, 338 RBI, and 24 SBs in 2,282 at-bats. His K rate (19.2) projects to be about the league average (20.3) with a slightly negative on his walk rate (7.4). Guzman doesn’t have a high ceiling, so his limited power won’t play well long term at first base in the majors. More of a short-term cover if needed in the big leagues. Jose Trevino (C) – Jose has played a game over AA in his pro career. Over four years in the minors, Trevino hit .267 with 39 HRs, 222 RBI, and six SBs in 1,547 at-bats. This season Jose will start the year at AAA with a chance to earn backup at-bats with Texas later in the year. Drew Robinson (IF) – Robinson flashed power (.224 with six HRs and 13 RBI) over his 107 at-bats in the majors in 2017. His downside is tied to a huge K rate (34.7) even with a high walk rate (11.6). Drew hit .247 over eight seasons in the minors with 89 HRs, 396 RBI, and 82 SBs in 2,692 at-bats. Robinson has a 20/15 skill set if given enough playing time with a better approach in the minors (K rate – 26.1 and walk rate – 14.1). Ryan Rua (OF) – Ryan will compete for a backup role at first base and in the outfield in 2018. Over four years with the Rangers, Ryan hit .305 with 17 HRs, 55 RBI, and 12 SBs in 557 at-bats. In his career at AAA, Rua hit .272 with 23 HRs, 88 RBI, and seven SBs in 547 at-bats. Not a bad bench flier in AL-only leagues if given an opportunity to work his way into a platoon role. Hamels failed to pitch over 200 innings last year for the first time since 2009. For the second straight year, he had a poor walk rate (3.2). Unfortunately, he lost his K ability as well (6.4 strikeouts per nine – career low). Cole had a good ERA (3.03) and WHIP (1.133) over his first five starts, but he showed risk in his command (12 walks and 15 Ks over 32.2 innings). 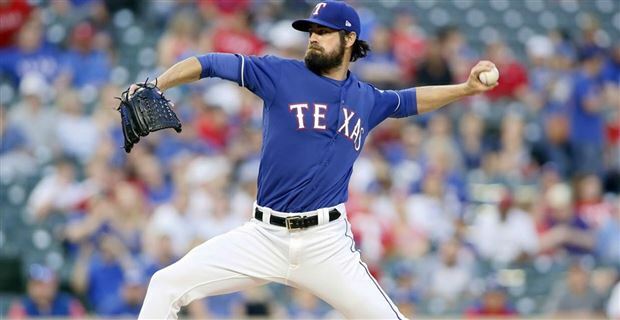 After missing two months with an oblique injury, Cole had a losing feel over his last 19 starts (4.53 ERA) with most of his disaster outings coming from walks (41) and HRs (14) over his last 115.1 innings. Hamels continued to pitch well against lefties (.161 with two HRs over 118 at-bats) while showing regression against RH pitching (.247 with 16 HRs over 430 at-bats). Most of the damage in walks (47 of 53) came vs. righties. HIs AFB (92.2) was lower than his last seven seasons, but batters still only hit .244 against his four-seamer. Cole had success with his changeup (1.78 BAA), curveball (.177 BAA), and cutter (.188 BAA). Other than his sinker (.269 BAA), Hamels still had the stuff to get batters out. His decline in command is a concern especially with a good history in this area (2.5 per nine). Cole has a long successful resume in the majors, and he is a hard worker. I expect a bounce-back season. Possible double-digit wins with a sub 3.50 ERA and 175 plus Ks. Moore came to the majors with a live arm and elite upside. One TJ surgery later, Matt became a weak pitching link in the majors over the last three years (22-31 with a 4.85 ERA and 1.423 WHIP). In 2017, he allowed the most runs (107) in National League while struggling with walks (3.5 per nine) and home runs (1.4 per nine). Moore had an ERA over 4.70 in each month. HIs AFB (92.5) was career low. Batters drilled his four-seam fastball (.300 with 16 HRs over 303 at-bats) and his cutter (.322 with five HRs over 118 at-bats). He had no pitch that graded as an edge. Loads of disaster in this arm, but the Rangers saw enough to give him a shot at a starting job in the majors. Tough draft investment and ever tougher fix for a pitching coach. The ball lies 250 yards away from the green over water with the wind in your face; a winning swing may not be enough to control the downside damage. $1 special in auction leagues while being a waiver wire option in almost every Fantasy league. Fister has been a poor major league pitcher over last three seasons (22-29 with 4.58 ERA and 1.408 WHIP). He pitched his way out of baseball last year, but Boston took a shot on him with a minor league contract. Over his first 14 games with the Red Sox, Fister had a 3.91 ERA and 65 Ks in 73.2 innings. Batters only hit .232 against him over this span while allowing three runs or fewer in ten of his 11 starts. Doug had fade over his last four starts in September (9.18 ERA and .338 BAA) to mask some nice innings. His K rate (8.3) was a career high along with his the most walks of his career (3.8 per nine). His arm was very good against RH batters (.208 with three HRs allowed in 173 at-bats). To maintain longer success in the majors, Fister needs to figure out how to get lefties out (.300 with six HRs over 170 at-bats). His AFB (90.0) was better than his last five seasons in the majors. Batters had the toughest time with his cutter (.154 BAA) followed by a decent curveball (.241 BAA). The key to his rebound is a better sinker (.294 BAA). He remains a groundball pitcher (50.6). May not be dead in the water, but I’d suggest you drive him carefully as a matchup only play out of the gate. Just remember, Fister had a 3.11 ERA over 116 games from 2011 to 2014 with the same arsenal and better command. After missing two seasons with a battle with a left shoulder injury that required surgery in May of 2015, Minor came back in a big way as a reliever. His walk rate (2.5) fell in line in with his career resume (2.6) while gaining strikeouts (10.2 per nine). Mike had the best fastball (94.7) of his career. Batters only hit .192 against his four-seamer plus a high level of success with his slider (.200 BAA) and curveball (.150 BAA). As a starter in 2012, Minor had a very good changeup (.215 BAA), which had less value (.268 BAA) in the bullpen. He pitched well vs. RH (.223) batters with more success against lefties (.163 BAA). In his career, Mike has a 4.10 ERA as a starter with 564 Ks in 65.1 innings. Interesting backend starter with the arsenal to have winning value as a starter. The trick is keeping his shoulder healthy enough to handle the jump in workload. With 150 innings pitched, Minor should have an ERA under 3.75 with respectable Ks. His stuff may wear down over the second half the year with the rise innings. I’m buying as the right price point. Over six seasons in the minors, Mendez went 28-18 with a 2.89 ERA and 404 Ks in 430.1 innings. His arm did take a step back in 2017 at AAA (3.92 ERA with 124 Ks in 137.2 innings) due to struggles with home runs (23 – 1.5 per nine). Texas gave him seven games in relief late in the year, but Yohander allowed seven runs, 16 baserunners, and three HRs over 12.1 innings with a decline in his strikeouts (5.2 per nine). His AFB (92.8) was below his expected value. His changeup (.059 BAA) graded well with Texas. Upside young arm that is close to being in the majors. He needs to clean up his command with his fastball in the strike zone develop a breaking pitch to add to his swing and miss ability. I expect him to be in the majors early in the year with his changeup leading the way. Perez has been a bad major league pitcher over his last four seasons (4.56 ERA and 1.452 WHIP), but he has a 30-32 record. His K rate (5.6) doesn’t have a pulse with a week walk rate (3.1). Martin pitched at a respectable level over his last 11 games (8-2 with a 3.71 ERA). In December, Perez had surgery to repair a broken right elbow. Texas expect him to be ready close to opening day. He struggled with RH batters (.310 BAA) while issuing 55 of his 63 walks and 21 HRs to them. Martin has a decent fastball (93.5), but none of his pitches offers an edge to get batters out. In 2016, Perez had a plus changeup (.211 BAA) and slider (.227 BAA). Lefties tend to have nine lives. With no command and no difference maker pitches to get batters out, Martin has disaster waiting in too many outings. Pure avoid on draft day. Palumbo has been brought along slowly over his minor league career. He’s never thrown more than 100 innings in any season plus Joe had his success cut short in April in 2017 due to a left elbow injury that required surgery. Over five seasons in the minors, Palumbo went 16-13 with a 2.61 ERA and 258 Ks in 231 innings. He’s never pitched at AA or higher while entering 2017 at age 23. Texas won’t push him early in the year, so Joe is just a name to follow in case he makes a push over the second half of the year. Palumbo has a low 90s fastball with more upside when he adds bulk HIs curveball is his best pitch while developing his changeup. The closing job for the Rangers will be wide open in 2018. Kela has the best arm for the job, but he needs to throw more strikes (4.0 walks per nine in 2017 and 3.5 in his major league career). Keone has an elite K rate (11.9) while being extremely tough to hit last year (.135 BAA). He owned righties (.113 BAA) with strength vs. LH batters (.170 BAA). Even with his exciting upside, Kela landed on the DL a couple of times with bum right shoulder and a forearm injury. His best run of the year came from June 10th to August 3rd when he didn’t allow a run over 12.2 innings with five walks and 19 Ks. His AFB (96.7) is elite with batters only hitting .188 against it. Keone has a plus curveball as well (.090 BAA). Last season he turned into an extreme fly ball pitcher (57.3 percent) while maintaining a respectable HR/FB rate (8.5). On the verge of great things in the 9th innings if he can stay healthy. Nice late gamble for saves and I expect him to win the closing job out of spring training. Over four seasons in the majors, Claudio has a 2.66 ERA, 117 Ks, and 11 SVs over 162.1 innings. His best asset is his command (1.6 walks per nine), but his lack of K ability (6.1 per nine) suggests he doesn’t belong in the ninth inning long term. Alex converted 11 of 15 saves, but he had plenty of risk against RH batters (.275 BAA). After a rough May (4.91 ERA and four HRs allowed over 14.2 innings), Claudio had a 2.33 ERA and 44 Ks in his last 58 innings. Alex features an 87 mph sinker, but batters hit .301 against it. Both his changeup (.159 BAA) and his slider (.138 BAA) are plus pitches. Avoid betting on his 11 saves. Lefty set up man with only short-term value if needed in the 9th. Bush earned the closing job out of spring training, but he allowed two runs and four baserunners over his first 3.2 innings to add some questions about his long-term viability. Over a six week stretch, Matt picked up six saves while tossing 15 shutout innings with 16 Ks. A disaster runs from May 31st through the end of June (9.58 ERA and .415 BAA) led to a lost closing opportunity. Bush regained his form in July and August (1.47 ERA and 22 Ks in 18.1 innings). A right knee injury cost him three weeks in late August and early September. Over his last eight games, he lost his way (10.80 ERA and 3.93 BAA). Matt had surgery after the season to repair an issue with his right shoulder. He’s expected to be ready for opening day, and he may even get a chance to start. Bush had the most risk vs. lefties (.284 BAA) while struggling to hold runners on base (nine steals in ten attempts). His AFB (97.9) is special, but his secondary stuff didn’t grade well in 2017. Thre’s still hope here for saves, but he has to work his way back up the food chain. His 2016 season suggested more overall value in his pitches. Take the free swing at saves while avoiding any thought of him holding up as a starter.